Faith & Form magazine and The Interfaith Forum on Religion, Art, and Architecture (IFRAA) has chosen the Beck-designed Joyful Church as an winner of a 2016 Award in the category of Religious Architecture: New Facilities. 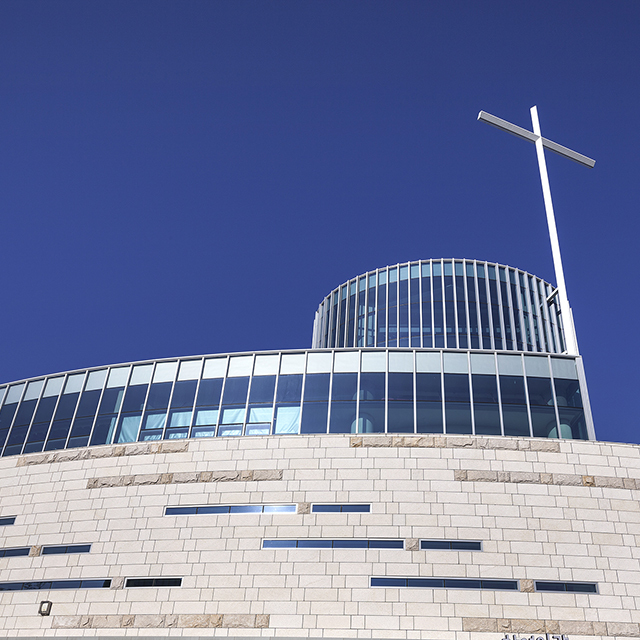 The Joyful Church’s vision was a design that expressed a strong symbolic Christian message incorporating traditional Korean references in a fusion of architecture, faith and culture. The location, a 10-acre site in a new town development area of Pohang, South Korea, came with challenges including steep, wooded hillsides and strict zoning limitations. Beck’s solution provided a 383,500 square foot facility that integrated into the landscape with gently flowing lines wrapping a large central plaza. Spaces included a 2700-seat sanctuary, 800-seat chapel, cafeteria, cafe, library, fitness facilities, children’s and youth spaces, community services facilities and a 350-car underground parking garage. Placement of the buildings into the natural hillsides and careful orientation of glazing allowed ample natural light into the spaces while providing greater energy efficiency. 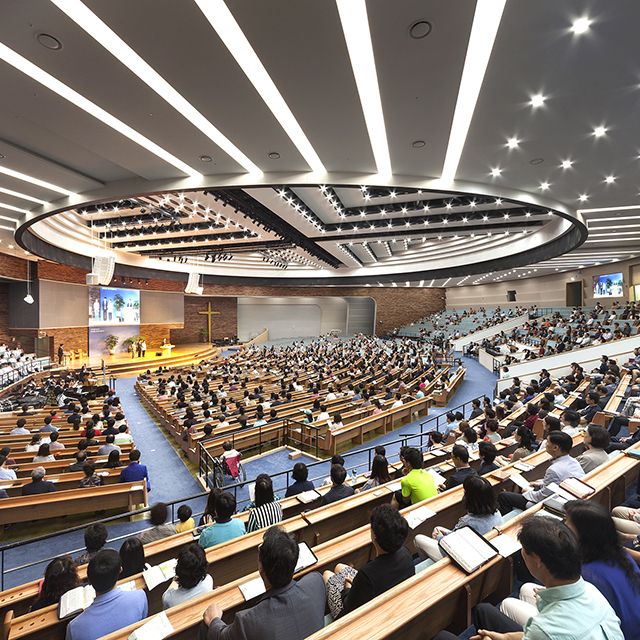 To blend the practical functions of a modern Christian church with the culture the design team drew inspiration from Korea’s rich history of architecture, crafts and calligraphy. The Taegeuk, a traditional symbol of harmony, found on indigenous artifacts dating back 1,400 years and included on the country’s flag, was the inspiration for the organizing form of the site plan and diagram of the two-building complex. For the main Sanctuary, a Togack-Wanja-Moon pattern which is found in calligraphy, art and architecture, was the basis of a dramatic ceiling design. The form referenced not only it’s origin, but was a stylized symbol of the Christian cross, providing a powerful vertical focal point for the worshippers’ experience. A stylized interpretation of the pottery pattern, Pa-U-Moon, created a unique form for the walls and ceiling for the smaller Chapel space. These forms also provided a unique solution to the acoustical support required for the use of this space for special musical performances. Wanja-Kuem-Moon, a graphic symbol found in many examples of historic Korean architecture, was utilized on the exterior and interior of the buildings. Metal panels and other contemporary materials were used to recreate the traditional patterns. Wanchojang, the Korean art of creating mats, baskets and boxes from woven sedge, inspired exterior facades. Patterns reminiscent of this play prominently in the exterior walls by interspersing long, narrow, rectangular windows into the rock façade in a staggered pattern resembling a basket weave. The winning entries are featured in the Winter 2016 Awards Issue of Faith & Form magazine and an exhibition of award-winning projects will be displayed at the 2017 National Convention of the American Institute of Architects in Orlando, Florida, in April.